Belle didn’t have one home—she had several. Will Simmons adopted the chocolate Labrador retriever when he began his Air Force career in North Carolina. When Will started his Iraq tour, Belle stayed with his parents, Bob and Julia. In 2009, during a stay with Bob and Julia, Belle’s appetite was “off,” and her health began to decline. After an examination, she was diagnosed with kidney failure due to advanced Lyme disease. The family lost her in November 2011. 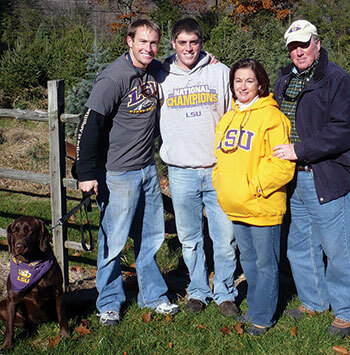 After Belle passed, Bob, a member of the first class to graduate from the LSU School of Veterinary Medicine, quickly began working with the school to establish The Belle Fund for Vector-Borne Disease Research. Over the next two years, Bob and Julia built the fund through consistent contributions that were matched by Bob’s employer, Merck. The fund supports the school’s research on vector-borne diseases in animals. A vector-borne disease, like Lyme disease, is a bacterial or viral disease transmitted by mosquitoes, ticks and fleas. “Lyme disease—which is rampant in New Jersey—as well as other tick-borne diseases, poses significant health risks for both animals and humans worldwide,” Bob explained. “The LSU SVM has a long history of researching tick-borne and other parasitic diseases.